1. Mix the mash, Cajun seasoning, salmon and sweetcorn in a bowl. Using floured hands, shape into 4 even-sized fishcakes. 2. Heat the oil in a large, nonstick frying pan and cook the fishcakes for 3–4 minutes until golden brown. Turn carefully and cook for a further 3 - 4 minutes. 3. Meanwhile, poach the eggs for 3–4 minutes or to your liking. 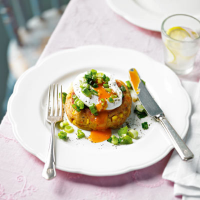 Top each fishcake with a poached egg then scatter over the salad onions to serve. This recipe was first published in Mon Apr 15 10:04:13 BST 2013.